Meishan pigs are named for the Chinese prefecture of Meishan. They are classified as a type of Taihu pig which are all from the narrow region of mild sub-tropical climate around the Taihu Lake region in Shanghai. 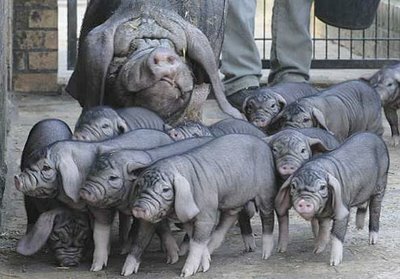 Meishan pigs are small to medium-sized with large drooping ears and wrinkled black skin. They are best known for its large litters of 15-16 piglets. Due to their fecundity, they were introduced into the United States under a cooperative effort of the USDA, the University of Illinois, and Iowa State University. This effort also imported Fengjing and Minzhu pigs from China. A total of 144 pigs from these breeds were shipped to the United States. Iowa State University received 22 Meishan females and 10 Meishan boars from this shipment on July 27, 1989. The breeds imported from China are slow growing and fat, but have a very good taste. They are considered to be resistant to some diseases and are able to consume large amounts of roughage. Meishan pigs are well fed and managed, being fed farm by-products and water plants, as well as concentrates.